An experience to know about our association and a community of people that participates in the local life of Cochin. 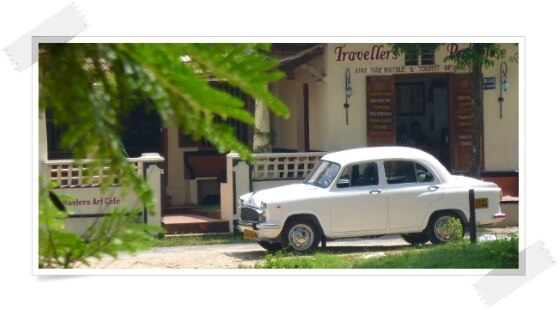 Through our association we invite travellers to Cochin and live the art of relaxing, observing, feeling, expressing and meditation in the daily life within our community. You are welcomed on arrival by the members of the association who have a taxi, a family homestay where you feel at home, Masters art Café where we serve delicious traditional breakfast and lunch which is an important place to relax, observe and taste the life of Cochin or a rickshaw to take you around and visit places of interest. Our creative textile workshop welcomes you to admire the creations made by our community women and if you wish to participate in our manual creative work and live the experience of slowing down with the women in our workshop. Meditation is part of our daily life, every morning and evening we get to live the experience of silent moments with all who are present here followed by the life experience teaching for those who want to know more about Yoga association’s philosophy. Our community members are treated by a traditional Ayurveda doctor who give free consultation for different ailments. The clinic gives also different types of Ayurveda rejuvenation therapies from 1 to 3 weeks for you. The travellers Paradise office is a place where you are welcomed and listened to for your personal and travel needs during your stay here. If you wish to experience a stay in the countryside, mountains, backwaters or the seaside of Kerala, you will be welcomed in our family homestays. We invite you to stay and live the daily life for at least 1 week in a homestay and know the life of our community. Our association is a charitable organisation, we generate income through organising your stay, selling our products and through donations, with this income we sponsor the least cared people for their health, education and housing needs. Travellers Paradise mantra is go slow and be relaxed, you will discover the beauty in everyone, everything and everywhere!